As technology has changed K–12 education, so has it changed the role of the chief technology officer, a job title that just barely existed 15 years ago. Today's CTO is not your grandfather's infrastructure manager! Technology is ubiquitous in today's classroom, so we sometimes forget it was just a short while ago that not even teachers had their own computers, let alone their students, who now sometimes come to school with two or three electronic devices. THE Journal contributing writer Michael Hart spoke recently with four veteran chief technology officers who were present at almost the very introduction of technology to K–12 education and asked them how their jobs have changed over the last 15 to 20 years. THE Journal: How has the role of the chief technology officer in K–12 education changed over the last 20 years? Keith Krueger has been CEO of the Consortium for School Networking (CoSN) for the last 21 years. Keith Krueger: Twenty years ago, when CoSN was started, there wasn't a career path to what we now call a CTO. It was only about 15 years ago that we started using that as a generic term for the lead person for technology in a school district. Kurt Madden: In the beginning it was all about wired networks and wired infrastructure. There was no wireless. Now, it's about moving things to the cloud. It's a lot more about facilitating collaboration and communication. And it's about analytics. Back then, you captured student data, but you didn't spend much time providing it for reports. We do more analytics of student and employee data to improve student results, hiring results and to improve professional learning. Mark Finstrom has been CTO of Highline Public Schools in the Seattle area since 2006, but began his career in educational technology 20 years ago. Mark Finstrom: It used to be that I dealt with buying and managing the hardware and software. And I provided services to the end user. That's no longer the case. Everything we do is integrating one thing with another thing. Krueger: Fifteen years ago, 80 percent of your job was wires and boxes. Today, that's only about 30 percent of the job. Now, the vast majority is understanding the education environment and, increasingly, you have to have leadership and vision skills. Finstrom: It's figuring out what 50 different applications are we using and how do I merge those together and the data within those so that the teacher can say, "Jimmy's actually on par today." Or, "Wow, I've got some work to do because Jimmy is falling behind." THE Journal: What role does the CTO now play in the district-wide decision-making process compared to 10 or 20 years ago? Madden: The stakes are much higher today. Finstrom: Nine or 10 years ago, I wasn't even on the cabinet. I was considered an operations person. It was not necessary for me to be involved in decisions related to instruction because the accountability was with the superintendent. Now, if I'm not at the table, they don't know how to get to the data they're looking for. They don't know what systems are available for us to provide feedback. Frankie Jackson: The primary difference is that we now work with executive-level leadership. Twenty years ago, technology leaders were thought to be leaders of hardware and software, leaders of student information systems. But since then, there's been this gradual move to where now technology is the underlying foundation of all services. Frankie Jackson has been CTO of the Cypress-Fairbanks Independent School District near Houston for the last three years and has served as a CTO in other Texas school districts since 1993. Krueger: It has changed dramatically, but it's less about the title and more about the scope of work. How do you help the professional learning department? How do you help everybody do things in new and powerful ways? THE Journal: How has technology changed the lives of students and teachers? Jackson: Students are connected 24 hours a day. They have the ability to collaborate and communicate all the time, to learn outside the classroom with instructional materials that are now readily available. The classroom walls have come down, learning is available at anytime and anywhere. Madden: The biggest change for students is having their own personal technology. Ten years ago, almost no student had a smartphone. Today, even lower-income students have their own. In an effort to assist public school districts, CoSN has established a "Framework of Essential Skills of the K–12 CTO," comprising three primary professional categories that attempt to define the work of leaders in the education technology field. These categories encompass specific skill areas that outline the responsibilities and knowledge needed to be a viable educational technology leader. Finstrom: We've gotten more into the role of providing students with devices. Students take the device home with them, and they're using it to do homework, to do social media. Parents are using them too because it may be the only computer in the household. It's helping mom and dad possibly to get a job. Madden: In the classroom, most of our teachers do a mixed media thing. The good ones are roaming around the classroom talking to students while the students are doing the work. Even those teachers who stay stuck at the front of the classroom, they have projectors and laptops utilizing rich media. Finstrom: Teachers are now as mobile as mobile can be, and they would love to be even more mobile. Our goal is to untether the teacher so that interaction doesn't require them to sit down with a device. THE Journal: What was the big challenge to CTOs in the past, and how does it compare to today? Jackson: The great challenge in the past was moving PCs into every staff member's hands. We weren't even thinking about student computers at that time. Now we're building an infrastructure to support everybody, not only to access devices provided by the district, but so they can bring their own devices and connect to the network. They've got phones, their own laptops, a district laptop. They may have a watch. We're planning for wearable technology. Krueger: The biggest complaint about the CTO in the past was that they were Dr. No. Their job was to lock down the network and to centralize the decisions for what got on the network. They have shifted, I think, from the lockdown-the-network guy to let's open up new kinds of learning that is much more personalized. Now the vision we have as a professional is to enable a collaborative environment. We see leaders driving that conversation, helping people in curriculum understand what the possibilities are. 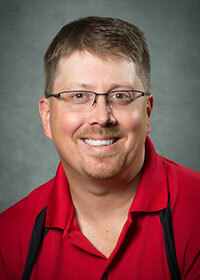 Kurt Madden has been CTO with the Fresno (CA) Unified School District for the last 10 years. Madden: The biggest challenge at the beginning was the plumbing, putting the infrastructure for the future in place. We knew so much of the content of the future was going to come through the Internet or the network. So we immediately utilized E-rate and were able to put fiber optic lines to all our schools and then began to do the wireless deployment. Making sure there is enough access is still the biggest challenge. Moving to cloud structure is one of those shifts you want to make sure you do right. Jackson: The other challenge is student safety. It used to be that students sat in the classroom and teachers could keep their eye on them. Now, once you give them a device, they can spin off and request information on the Internet and we have to be concerned about filtering content and appropriate, responsible usage. THE Journal: When it comes to the skills required of a CTO, is there any tension between technology and education? Krueger: I wouldn't exactly call it a tension. A lot of times people think that's you're the MIS [management information systems] director. That isn't the strategic piece most districts want you to meet though. You can contract out the technological stuff, but you can't contract out the leadership and understanding of the educational environment. Finstrom: If a technologist doesn't act like an educator, they will drive the technology side of the house in an efficient manner for them and leave the education behind. I know there are people still in that old mindset. I've got a master's in curriculum and instruction. Being an educator has allowed me to probably be more "all in" with the leadership team because I'm able to address things we're talking about. But I know peers who don't have that background are put into that role and, hopefully, have learned enough through their interaction with teaching and learning to know how to respond on an educational point of view as well. THE Journal: What will the CTO of the future have to know and do that today's technology leaders don't have to worry about? Finstrom: The CTO of the future has to be a change agent, an innovator and a thinker. The one that is going to drive change. We're not going to be dealing with the data in future years because other people will know it well enough to be able to do it. We will be innovating instructional practice. Krueger: We need to ask ourselves what we even mean by technology. I like what one of the founders of Apple, Alan Kay, said: "Technology is anything that came after you were born." Less and less the word technology will be in the CTO's title. More and more it will be chief innovation officer. We're going to see, as technology becomes less and less visible, innovation becomes more and more critical. Jackson: Our entire business is based on the ability to connect. If e-mail goes down, we're dead in the water. We just can't work. As we move more applications into the cloud, an absolute guarantee of 100 percent connectivity will have to be more of a priority. Madden: We're really switching to it being about information and less about devices. You won't have to worry about devices. You'll be focused on the flow of communication and information. The emphasis will be on how you can help people make better decisions. THE Journal: What advice do you wish somebody had given you when you first became a CTO? Finstrom: Don't be afraid of change. I wish a mentor would have said, "Just start making things happen." It took me three years to get to the point where change was something I should initiate. Now I do it every day. It's part of my job. Madden: I wish somebody had told me how long it takes to get things done. I was not used to the pace in public schools and the tendency to maintain the status quo. You can't just come in and change things quickly. You're a cruise ship that takes 3 degree turns, not a jet airplane. Jackson: I started my career in mission operations at the Johnson Space Center. I came from a very technical career to public education. I wish somebody had told me how far behind public education was. I never thought a district in 1994 wouldn't have a network. There was not the understanding that technology would come to be so mission-critical. Each year, CoSN conducts a survey of technology leaders in K–12 education. Typically, the survey paints a picture of how the field is changing and provides an overview of the challenges CTOs are facing, as well as their shifting priorities. The 2016 survey results were released in early May, and listed below are 10 key findings of the survey. The complete survey is available for free at cosn.org/itsurvey. 1. Broadband and network capacity is the top priority for IT leaders, replacing assessment readiness (which for the first year failed to make the top 3). 2. Privacy and security of student data is an increasing concern for IT leaders, with 64 percent saying they are more important than they were last year. 3. Nearly 90 percent of respondents expect their instructional materials to be at least 50 percent digital within the next three years. 4. Virtually all responders (99 percent) expect to incorporate digital open educational resources (OER) over the next three years, with 45 percent expecting their digital content to be at least 50 percent OER within that time frame. 5. Nearly 80 percent of IT leaders use online productivity tools — the largest use of cloud-based solutions in education. 6. District bans on student personal devices are a thing of the past — only 11 percent have banning policies. 7. The path to IT leadership differs for women and men. The vast majority of women come from educational and instructional backgrounds (72 percent). The majority of men (54 percent) come from technology or technical backgrounds. 8. Racial diversity in IT leadership is lacking. Ninety percent of school IT leaders are white. 9. IT leaders have advanced education, with 75 percent earning some credit beyond their bachelor's degree. 10. More than one-third of IT leaders plan to retire in the next six years.